In 1970 I received my bachelor’s degree from Carnegie Mellon University. 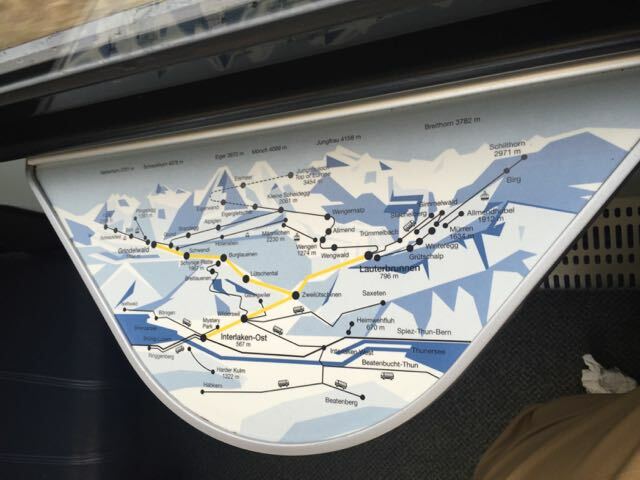 As a graduation present my Mom suggested a rail tour of Switzerland and handed me a brochure. I had no one to travel with so I declined the offer, much to my subsequent regret. 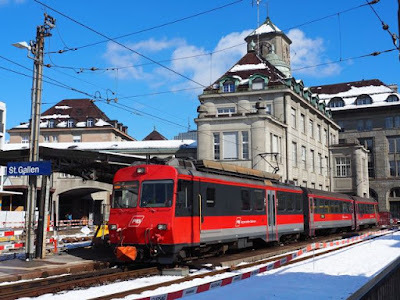 In February and March 1986 Trains Magazine published a two part article by George Drury about a week long trip that he took to Switzerland in 1983. This further whetted my interest in a rail trip to Switzerland, but circumstances kept me from pursing that interest for years. 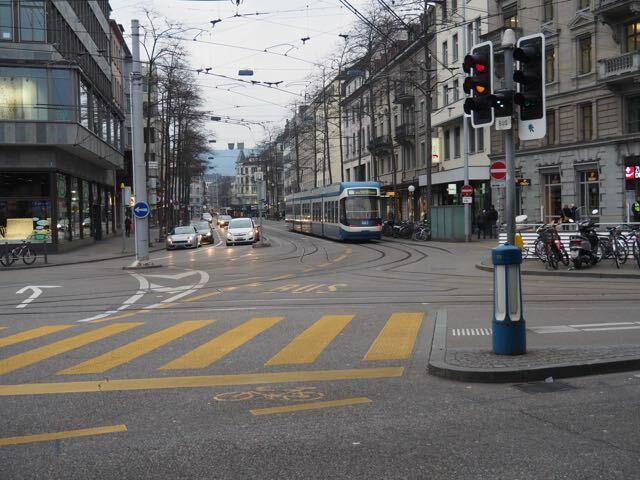 In summer of 2010 I was contacted by a potential client about some consulting in Lausanne. 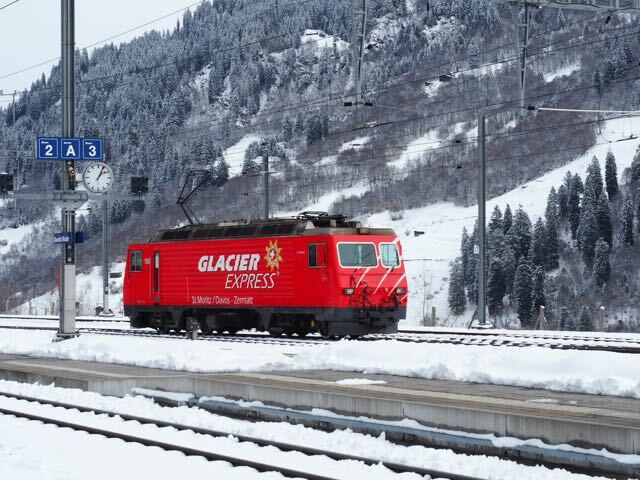 I quickly worked up a schedule that would allow me to ride the Glacier Express from Zermatt to St. Moritz before heading to Zurich and home. Unfortunately, the consulting did not materialize. But I became determined to eventually make the trip, with or without a client. I asked my friend Rick Moser if he’d be interested in such a trip but for various reasons he declined. 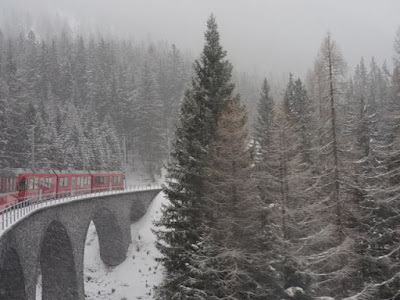 In October 2014 Rick and his wife took a European cruise and enroute rode the Bernina Express. 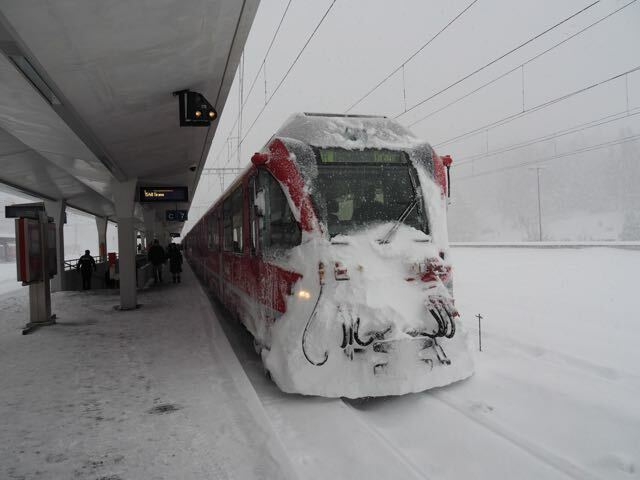 This whetted Rick’s appetite for more and early in 2015 he suggested that we plan an extended Swiss rail visit. We picked early March 2016 for our trip because we wanted to see Switzerland in the snow, and we wanted to go before the opening of the new Gotthard Base Tunnel began to divert traffic from the current route. Soon Rick’s brother Phil decided that he would join us. Shortly thereafter our friend Neil Lang from Oakland, California also signed on. They say that getting there is half the fun. For me, planning the trip is half the fun, getting there and back is (usually) a chore, and the trip itself is the other half of the fun. We decided to start with the 1983 George Drury trip as a base. However, there were many scenic lines that we wanted to cover that George’s trip had not covered. 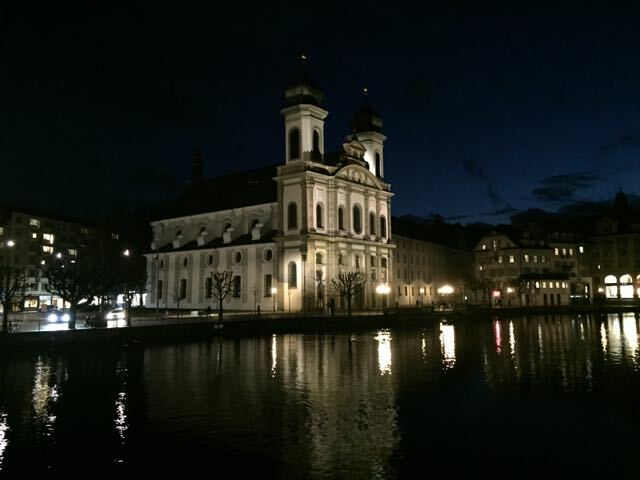 We eventually decided on a nine-day itinerary starting in Munich and ending in Geneva. 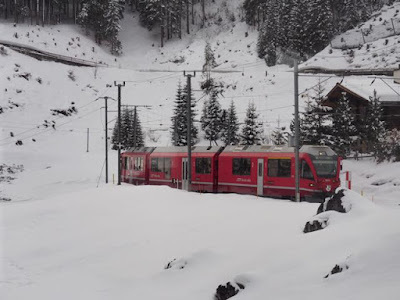 We picked Munich as the starting point because of the very scenic line between there and Innsbruck via Klais (the route used in filming Frank Sinatra’s Von Ryan’s Express) and the Arlberg Pass between Innsbruck and Switzerland. Other lines to be covered included the Centovalli Railway from Locarno to Domodossola, a bunch of secondary lines, and more. Planning the exact route within the time constraints took a lot of work and we had help from friends Hubert Horan (who had lived in Zurich as part of his job), and Nigel Eacock from the United Kingdom. A schematic map of our final route (as taken) is shown below. As shown on the map, overnights were scheduled in Munich, Zurich, Interlaken, Locarno, Montreux, Brig, Chur, Lucerne, and finally Geneva. Staying in New York also meant that I wasn’t limited to a US airline to London and since I had a large number of Delta miles (due to an aborted family trip to Japan after the Tsunami) I elected to fly Virgin Atlantic. As soon as it was possible I booked a Premium Economy ticket on their morning flight out of JFK (27,500 Virgin Atlantic miles plus $234.60 in fees). I then had to figure out how to get home. At first blush I had thought I’d just train from Geneva to London and fly home the way I came, but then I realized I could save a day on what already was scheduled to be a long trip by flying out of Geneva. After some looking around I decided to use more points to book a business class ticket from Geneva through Paris to JFK on Air France (62,500 Delta miles plus $278.99 in fees). As a bonus I’d be flying in an Airbus 380 for the first time. I then booked the appropriate flights in first class on Delta (not using miles) from Pittsburgh to New York on February 25, returning home late on March 8 ($392.20), and a Lufthansa ticket from London to Munich ($122.30) on February 27. Once the schedule was set and the flights books, we spent some time deciding on hotels and made reservations – some directly with the hotels, some with the online site booking.com and some with other sites. 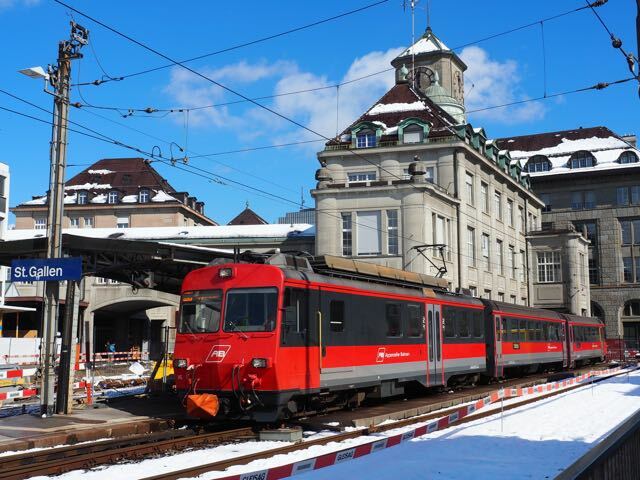 We also purchased first class eight-day Swiss Rail Passes that would cover everything except our inbound trip from Munich on the first day. The passes cost approximately $600 and were (and are) a great value. My friend Rick Moser has, for many years, produced booklets of rail locations for various trips we have taken in the US and Canada. These “Moser Sheets” show railroad locations and their mileposts. [i] I decided to do something similar for this trip. I ended up producing an 80-page coil-bound booklet that covered our daily travels including cities and kilometer post numbers. 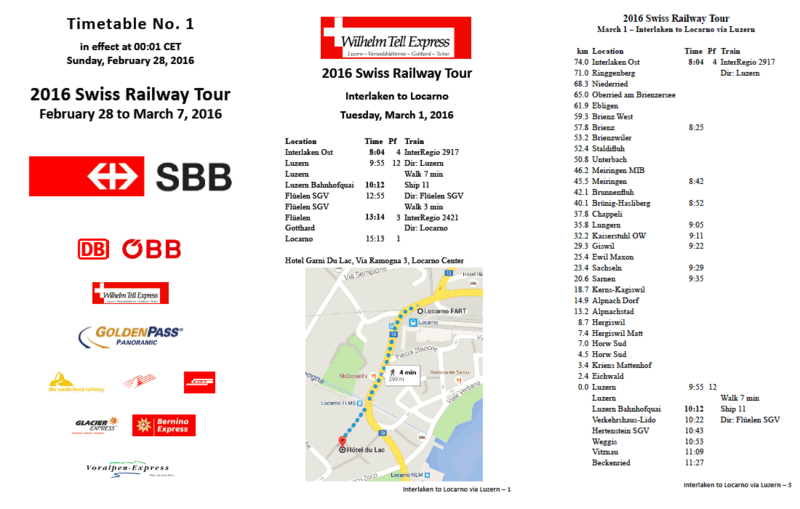 I used information from the Swiss Railway system at http://www.sbb.ch and from the Deutsche Bahn site at http://www.bahn.com. Kilometer post numbers were mostly obtained from the Schweers-Wall Eisenbahnatlases of Switzerland, Germany, and Austria. Subsequent to all of the planning an event happened that made me somewhat change my original plans. This was the opening of the hit musical Hamilton on Broadway. I had wanted to see this show almost from the minute I heard about it because I had recently read the biography of Hamilton by Ron Chernow and several friends had raved about it (including one who has been to see it well over a dozen times.) As it happens, I contacted this friend, Kim Scheinberg, when 60 Minutes did a segment on the musical, and while I was watching she picked up “literally the best seat in the house” for me, for basically list price. I found out later (from her) that she was not quite right. The best seat in the house was probably two to my left, but it was pretty damn good. Show ticket in hand, I had to worry abut getting there. I checked my flight times and decided that my Delta flight would arrive too late for me to feel comfortable about making the 7pm curtain so I called Delta to change my outbound flight. It cost me an additional $149.50 and a downgrade from first class to coach but it gave me an extra two hours to ensure that I was on time for the show. At this point the arrangements for the whole trip were intact and remained so. As the date of departure approached I was, of course, watching the weather carefully – worrying about whether my Delta flight to JFK would get me there in time for Hamilton, if at all. The days before JFK had real operational troubles due to storms and low ceilings. There were tons of air cancellations into all NYC airports on the 24th due to weather. When I checked flight status the morning of departure, the flight was showing on time, but the inbound from LGA was showing canceled. I finally figured out that things were so screwed up that various planes had overnighted in Pittsburgh including my 12:45 departure. This was mostly confirmed when a woman on the bus to the airport told me that she had been on a flight from CLE to LGA that day and they got all the way there and had to circle before heading to PIT to refuel. The subsequently canceled the flight at PIT. Anyway, our plane was sitting at the gate as promised with a coating of snow on it. That meant deicing. 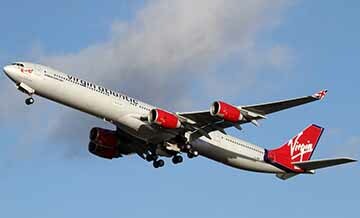 The flight was as smooth as could be expected given the winds, and we got to JFK at about 2:40, 20 minutes late. The walk from my gate took a good 20 minutes, but I found AirTrain to Federal Circle and a shuttle to my hotel (a Courtyard) and was I my room by 3:40. 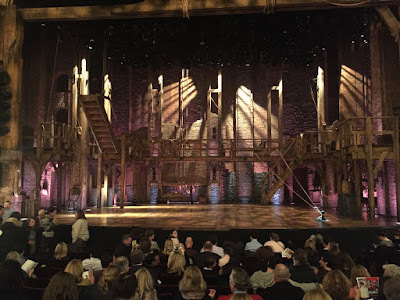 I got settled and cleaned up and then took the shuttle back to Federal Circle, AirTrain to Jamaica, and an E train to 50th St and 8th Ave, and walked four short blocks to the Richard Rodgers Theater where I will soon be seeing Hamilton. I was early so I walked next door to the lobby bar of the Marriott Marquis and listened to some jazz and sipped a drink while waiting. Hamilton was terrific – worth every penny. It was very faithful to his life (and death) story, dramatic, and funny, and full of great music including (and I am going to surprise myself by saying this) some great rap. (The surprise is because I generally hate rap.) The performance I saw had very few understudies and none in key roles so it was the real deal. My only complaint was that the Richard Rodgers Theater has taken lessons in seat pitch from the airline industry. Actually they have outdone the airline industry. There was essentially no leg room at all…and one of my knees started hurting immediately. But I made it. Would I go again…absolutely…but only with an aisle seat…and I probably can’t afford one of those. I had such an easy experience with taking the subway into town that I decided to not try to complete for a cab or Uber and take the subway out to Jamaica and a taxi or Uber from there. Big mistake. There is a major difference between an express at rush hour and a local after 10pm. I figure this easily added 30 minutes to my trip…30 minutes less sleep for me. Anyway, I was in bed just past 11:30pm. The alarm woke me in time (but too soon) at 5:00am to get ready for the 6:00am shuttle to JFK. Check-in was quick and easy (though security pretty much sucked) and I was at the gate about 6:40 for my 8:15 flight. 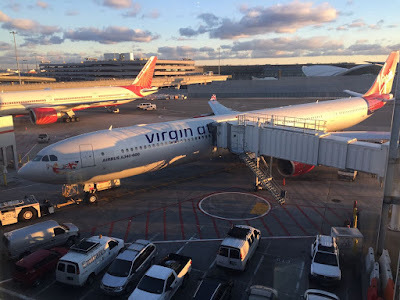 A few days earlier I had taken advantage of a Virgin Atlantic sale and upgraded myself to Upper Class (their business class) for an additional 12,500 miles and $185. This gave me access to the Virgin Atlantic lounge prior to my flight. The lounge was quite nice with table service so I had a quick bagel with smoked salmon (my first real meal since Wednesday!) before boarding at 7:20. I settled into my seat (which was actually more like a pod) and learned all (well most) of its tricks. We pushed back about 5 minutes early and spent a good 35 minutes on the ground before getting to a runway, but the pilot said we’d be early regardless. In any event, we landed at about 7:55pm and the plane pulled to the gate at 8:05pm (8:10pm was the carded time.) They had given me a “fast track” card to go to a special customs line, so after walking what seemed like 2 miles, I did…only to see people going through the regular line at least as fast! From there it was another longish walk to the Heathrow Express connector to terminal 4 and yet another long walk to my hotel (a Hilton) the only one connected to the airport by a walkway. This is misleading. It is connected to Terminal 4 only in the sense that the Palmer House in Chicago is connected to Union Station by a sidewalk. It was a good ten-minute hike from terminal 4 to the hotel. At least I got some exercise. After checking in, going to my room, and cleaning up a bit, I went down to the lobby bar for a beer before going back up to bed where I slept soundly. I awoke in my Hilton hotel room at 6:30am – about 30 minutes ahead of the alarm I had set. I showered and dressed and went down for the complimentary breakfast before finishing packing and checking out of the room about 8:30am for my 11:10am flight. I could have stayed at the hotel for an extra 30 minutes at least, but had been advised not to. The walk back to Terminal 4 seemed a lot shorter…perhaps because I was fully rested. A Heathrow Express terminal shuttle was right there and I was at Terminal 2 shortly thereafter…but Heathrow really knows how to make its passengers walk. Security was fairly simple and I went from there to the Plaza Premium Lounge (a benefit from one of my credit cards) to wait for them to post a gate announcement for my flight to Munich. There, if I had liked, I could have had my second full breakfast of the day! Before continuing, it is probably worthwhile here to talk about my traveling companions who I was meeting at Munich to start the actual Switzerland Railroad Tour. Rick and Phil Moser are brothers from the Chicago area. I’ve known and been friends with Rick since late 1983 and with Phil for only a slightly shorter time. They elected to do additional train riding in Europe for a week prior to arriving in Munich. They flew to London a week ahead of me and from there took trains to Amsterdam, Berlin, Hamburg, and other places. 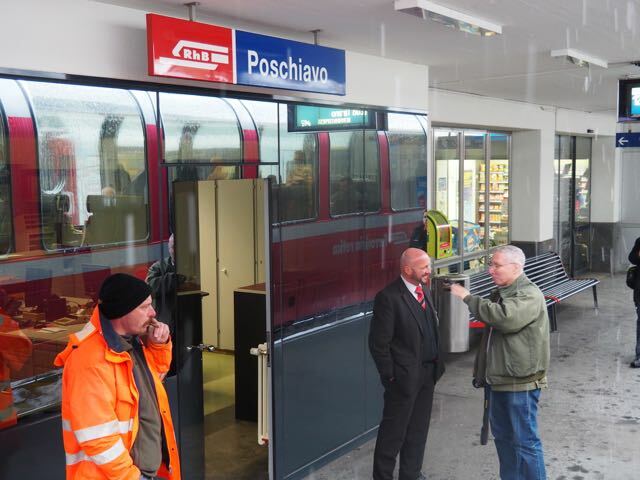 They were arriving in Munich from Hannover around the same time that I did. The fourth member of our group was Neil Lang from Oakland, California. I’ve known him since about 1978 when I also lived in Northern California. He was spending a month in Venice and decided (as he puts it) to take a vacation from his vacation to join us for most of the tour. He took the overnight train from Venice to Munich arriving in the morning shortly before we were scheduled to depart for Switzerland. My friend and colleague Neeraj Suri and his wife Elisabeth Suri-Payer had planned to join us from their home in Hannover for the first leg of our trip out of Zurich but other plans got in the way, so they came down (Neeraj from a meeting in Naples, Elisabeth by train from Hannover) to spend the night in Munich and have dinner with us instead. Immigration was trivial but a bit of a walk (so what else is new?) and my bag was one of the first off the plane. Neeraj had arrived a few minutes earlier and he met me at the baggage claim before I could even look for him. 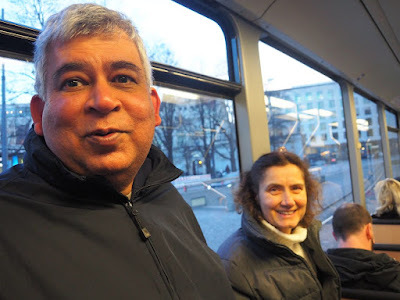 We then caught an S-Bahn train to the Hauptbahnhof in Munich where we met up with Elisabeth, Rick and Phil. After introductions all around we headed to our hotel, the InterCity, which was right next to the station and we were soon all checked in, and shortly thereafter went for a walk down the Marienplatz. At some point Rick and Phil left to go back to the Hauptbahnhof to take some pictures, and Elisabeth, Neeraj and I walked some more to see some of the sights before catching a tram back to the station and the hotel. At 6:15 we all met in the lobby and walked several long blocks to the Augustiner-Keller restaurant where we all had great German beer and Bavarian food. The restaurant has been around since 1487 and since I’ve been to Munich at least twice before I’m sorry it took me this long to discover it. Anyway, everyone agreed and so the morning found us at a crowded Munich Hauptbahnhof boarding our train to Innsbruck. The train itself was just a run-of-the-mill German train (that is to say, miles above Amtrak, crowded, clean, with huge clear windows, quiet, smooth ride, but otherwise nothing special.) We quickly found seats in 2nd class as the price difference to 1st class was too great and there was not a lot of added value. The train left on time, arrived on time, and provided all the scenery we could ask for. It did a great on and off business enroute, but it never felt overly crowded. We had about 20 minutes in Innsbruck before we boarded our RailJet to Zurich. This train was fancier than the one down from Munich and we had a table for four in 1st class. 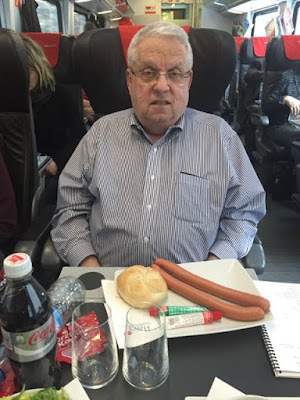 There was a restaurant car, but we elected to be served a light lunch at our seats instead. As we headed up through Alberg pass, through the Arlberg tunnel (6.62 miles long) and down the other side we enjoyed the spectacular scenery and watched skiers lug their huge bags of equipment through the train. 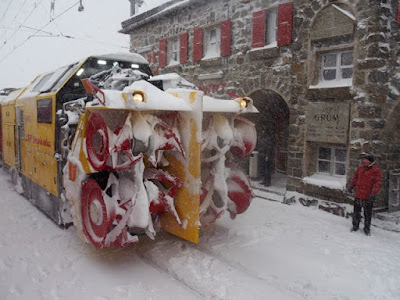 At one point a gentleman from Lake Tahoe sat across from us and we had a nice conversation about our trip and his trip (he was spending two disconnected weeks at Club Med in St. Moritz where they were praying for snow.) Mid-afternoon found us gliding along the rails alongside of Zurich See and into Zurich itself. 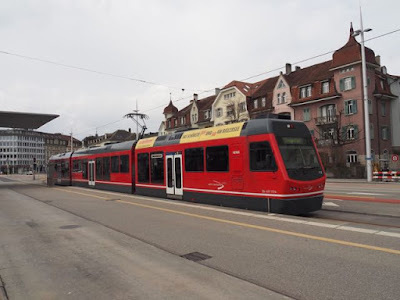 Our hotel was a 10-minute walk from the Zurich Hauptbahnhof and we quickly checked in and then went back to the station to 1) get some francs from an ATM, 2) buy tickets for the Jungfrau trip the next day, and the Gonergrat trip on Thursday, 3) get a Swisscom SIM for my iPad, 4) pick up some Swiss power adapters (somehow I thought that standard European adapters would work), and 5) take some pictures of trains and the station. Then it was back to the hotel to rest and clean up before dinner. Dinner was at a simple Swiss-style restaurant in the old town area of Zurich. It was delicious and relatively inexpensive given that we are in Switzerland. We got back to the hotel around 8 and were amazed to see how alive the whole area was, with tram after tram going by in multiple directions, and people actually using them. After a fairly restless Sunday night, we began our Swiss Pass travel. For those who don’t know, the Swiss Pass allows unlimited travel within Switzerland and covers almost every form of transportation and almost every railroad line. In our case we had chosen the 8-day First Class Swiss Pass and according to people who live in Europe the price was a bargain. 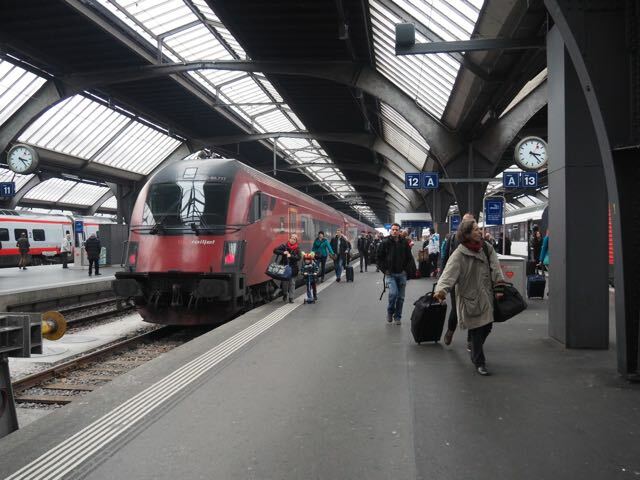 Bright and early we headed down to the Zurich Hauptbahnhof for our train which was to leave at 8:02a for Bern. We got there in time to pick up a few breakfast items at a stand in the station and then headed down to Track 32 to await our train. The prior day we had been advised not to bother getting seat reservations as a lot of folks get off the train at Zurich. It was no problem getting seats, but mostly we were unable to sit together. The train was a double decker InterCity train and it was not much fun lugging luggage up to the top floor, but the view from there was great…or would have been if it wasn’t so cloudy/misty outside. 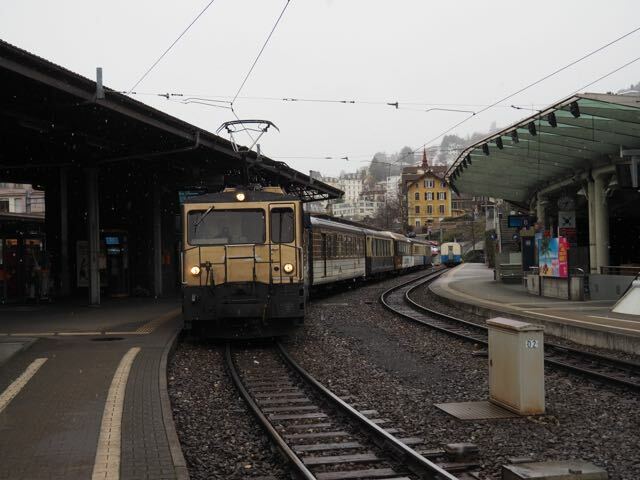 We pulled into Bern on time and had a 6-minute connection to a train on a different platform. That worked out fine, though again with the stairs. No ADA in Europe! 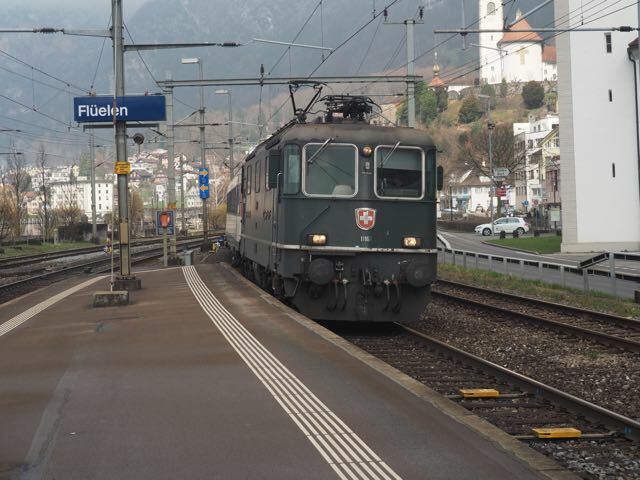 The train from Bern to Interlaken was a single level train and very comfortable with huge windows to take in the scenery along the Thun See. 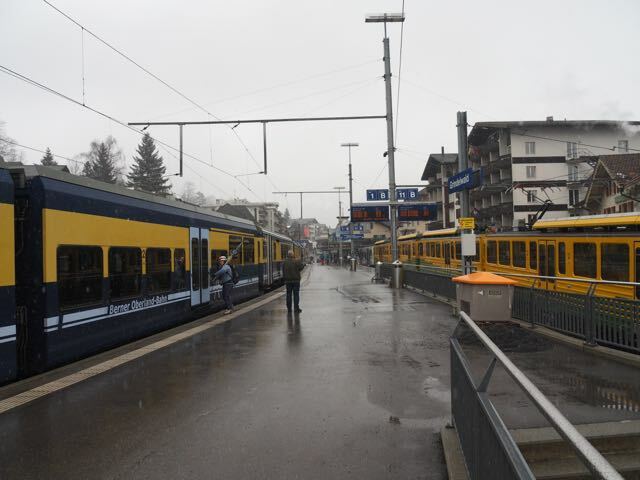 We rolled through Spiez which we’d see again in a few days and on into Interlaken Ost station. Although this is where we were spending the night, we first had to climb a mountain. 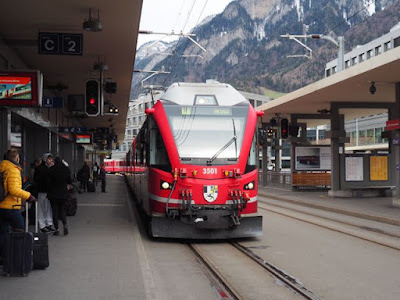 We checked our big luggage at the station and boarded the first of three trains that would take us to the top of Europe on Jungfrau mountain. Because of the clouds, etc. we did not have much hope of seeing much, but we felt we needed to take in the experience. 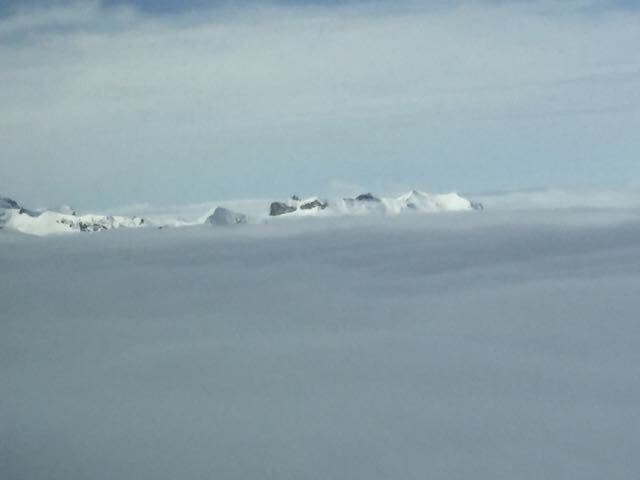 We had planned to stay at the top for an hour+ but the weather was so uncooperative (that is, we couldn’t see much due to the clouds) that we just turned around on the same train and headed back to Kleine Scheidegg. At that point we took the alternate route down through Grindelwald instead of Lauterbrunnen. 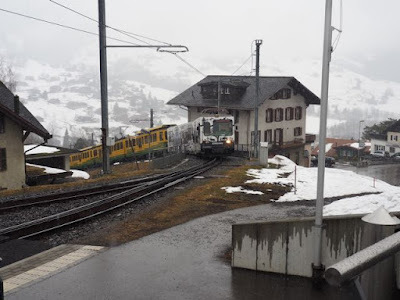 At Grindelwald we boarded a train that would take us back to Zweilutschinen where it would be joined with a similar train coming from Lauterbrunnen and then onto Interlaken Ost. Oh, the Swiss Pass only took us up as far as a place called Wangen (just below Kleine Schiedegg) and back from Grund (also just below Kleine Schiedegg). We had to pay an exorbitant extra fare (133 CHF at a discount because of our pass) to go to the top. From the station we made a short walk in the rain to our hotel, the Interlaken Hotel which was very nice. We rested in our rooms until dinner time at which point we walked (in the rain) to a restaurant named Des Alps about four minutes from our hotel and had a very nice dinner together. I woke just ahead of my alarm which had been set for 6:30am. 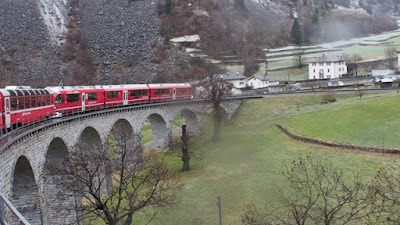 Our train today left at 8:02am from the Interlaken Ost station. We had reserved seats in first class car #7 but the train pulled in and there was no car #7—so we just took seats in a mostly empty first class car and that was fine. (A bit later the conductor asked if we were the four with the reserved seats and explained that there had been an equipment substitution.) 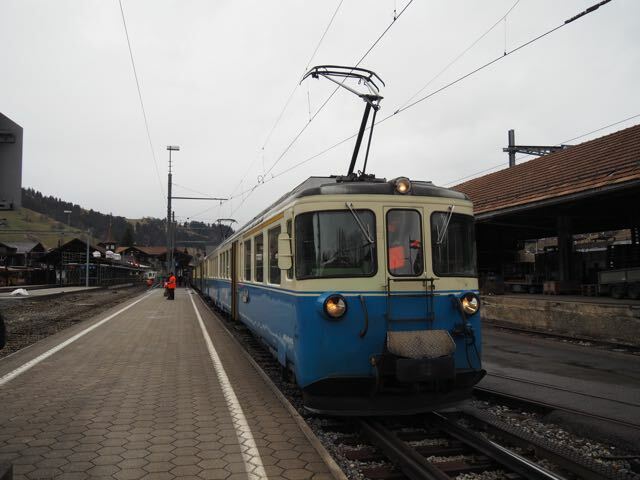 The route to Lucerne is on the only meter gauge railroad on the Swiss Federal system. It uses both adhesion (normal steel wheel on steel rail), and rack (where the grade is too steep for adhesion.) The first roughly one third of the trip is pure adhesion, but then it reverses and climbs a hill and an impossible angle before eventually descending to a valley on the other side of the mountains. As the train rose the snow covered trees were a beautiful sight. 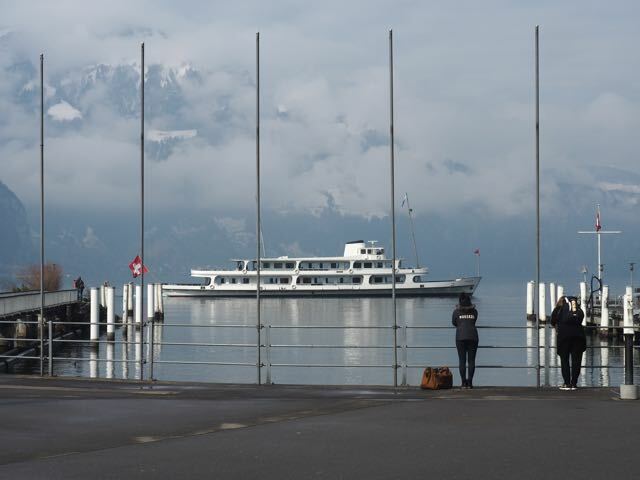 The train arrived in Lucerne right on time at 9:54am and we quickly found our way to the appropriate pier (after a short misstep) to board our ship, the Schwyz, on which we would begin our trip on the William Tell Express. 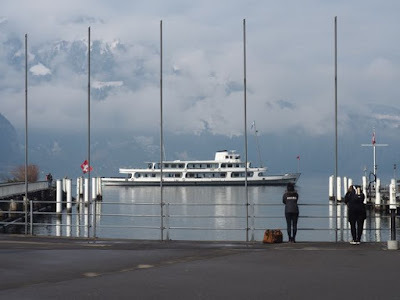 We took seats in the first class dining room and watched as the ship ferried us (making stops along the way) to Fluelen on Lake Lucerne as we ate an excellent meal. 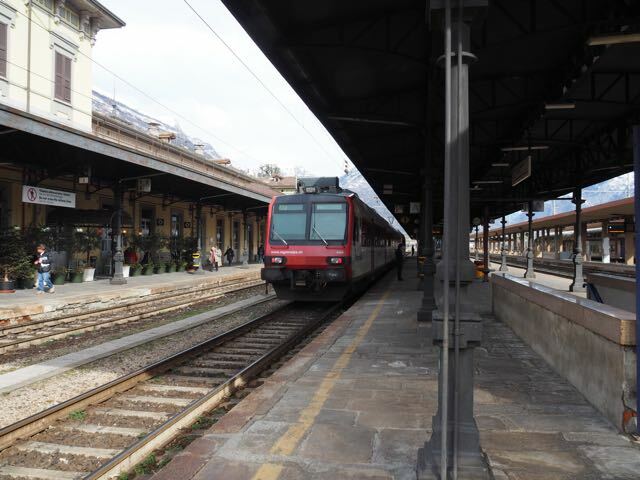 Once reaching Fluelen, we waited a few minutes for our train that would take us the rest of the way to Locarno, our overnight stop. 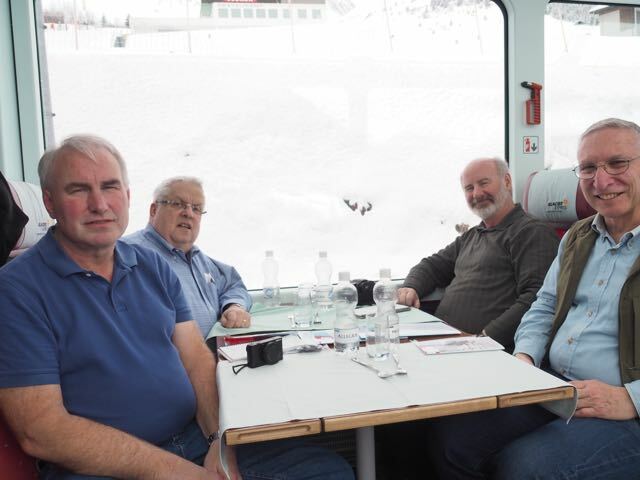 Again, we had first class seats in a not-very-crowded panorama car that afforded us spectacular views of the mountains and the valleys, and the incredible Swiss infrastructure which puts anything in North America to shame. 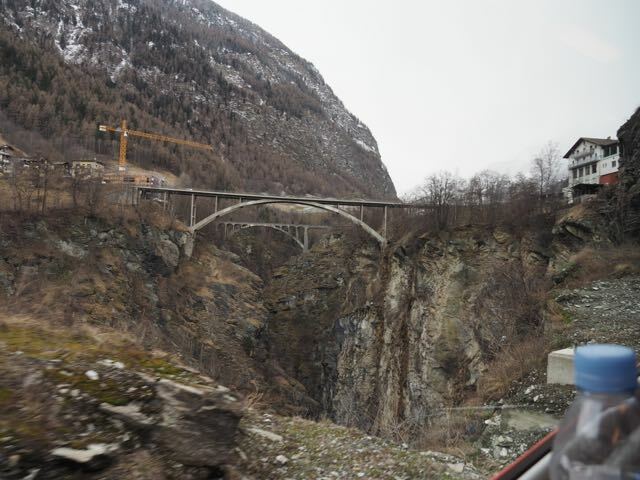 This is the famous Gotthard Pass route and it included a 9+ mile trip through the Gotthard tunnel. Trains ran on this line as if they were street cars in most American cities that have them. If you missed seeing one as it went by, you’d only have to wait a few minutes until the next one came along. Interestingly enough all announcements aboard this train were in German until after we went through the tunnel, at which point they were all made in Italian. 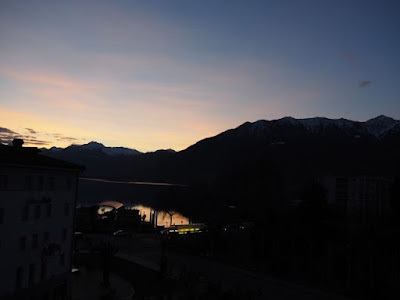 We arrived right on time at 15:13 and were very soon checked in to our hotel the Hotel Garni Du Lac, each with a room overlooking the lake and the mountains, complete with balcony. The weather was in the 60s and for the first time on the entire trip the sun was out. 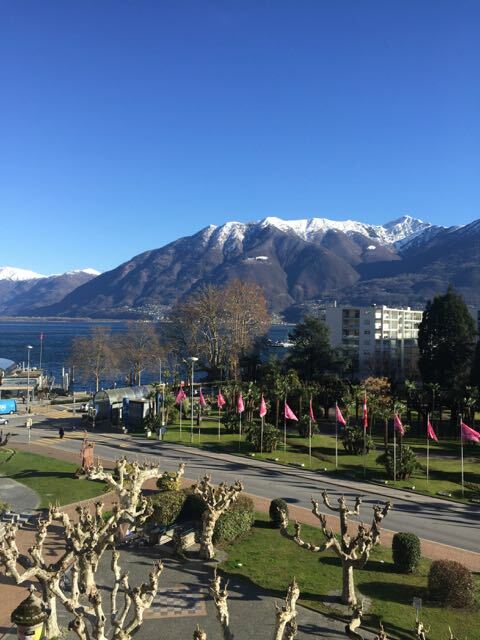 We spent time walking around the area near the lake, and relaxing in our rooms before heading off to dinner at a very good local pizzeria. We awoke to a sunny and relatively warm day in Locarno, and ended with a cool and damp one in Montreux. 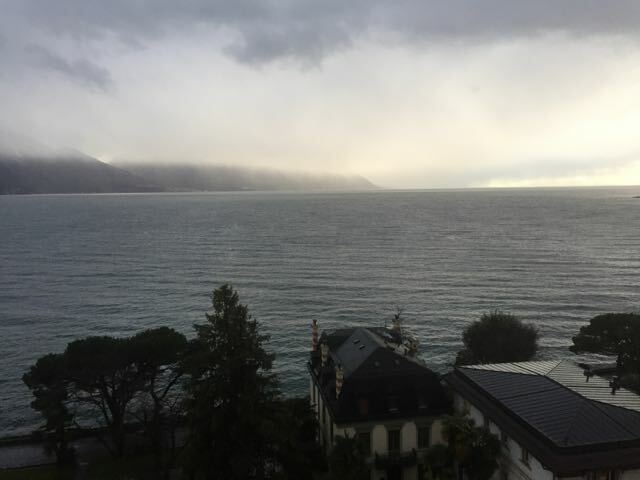 I went from a room with a lake view with mountains all around to a room with a lake view with clouds and mist all around. I went from an area of Switzerland where Italian predominates to an area where German predominates before eventually ending up in an area where French predominates. It was a great day. 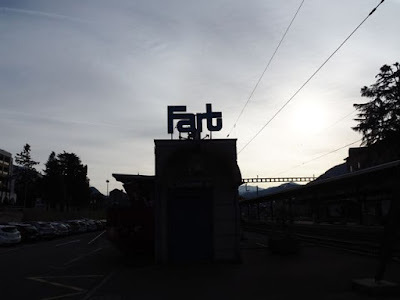 We left Locarno by taking a big FART train (well not so big, but how could I resist a line like that?) 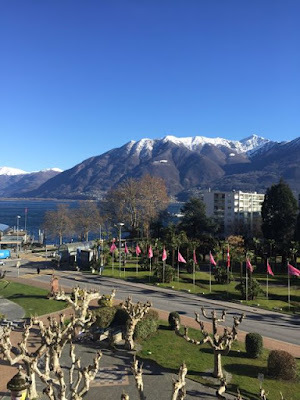 from Locarno to Domodossola. The former is in Switzerland and the latter is in Italy. FART is the name of the rail company that runs the Centovalli Railroad between those two points. It is a spectacular route with lots of impossible climbs and incredible scenery. We had been aware for some time that the section between Integra and Camedo (about 8 km) was out of service necessitating a fairly brief bus transfer. We were worried about our 12 minute connection in Domodossola but in the event the connection was fine. We were not worried about the connections elsewhere, but in fact we should have been. Shortly before reaching the famous Simplon tunnel on our train out of Domodossola (12+ miles long) our train was stopped while we waited for two freights and a passenger train to pass us. Shades of Amtrak! This delayed us something like 26 minutes and we were unable to make enough time to make our 20-minute connection in Brig. In fact, the train we wanted to catch probably left one minute before we arrived. The delay was disappointing, but unlike in the good old USA it we could recover from it without waiting up to three days for the next train. There was a train leaving on the route that we wanted to take (there were others we could have taken) an hour later. 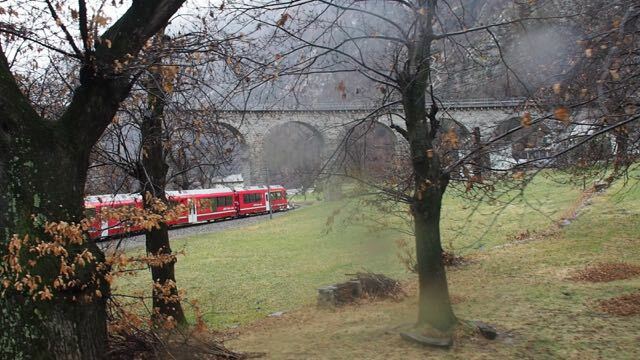 It left right on time at 12:36 and began another impossible climb up from Brig towards Goppenstein, the Lotschberg Tunnel (also 9+ miles) and on to Spiez. As we left Brig we could look down on the whole valley beneath us and see all of the fantastic rail (and other) infrastructure in the area. It was almost as awe inspiring as the mountains around us. We reached Spiez in time and made a quick connection to a train to Zweissman where we transferred to a Golden Pass Panoramic train to Montreux. 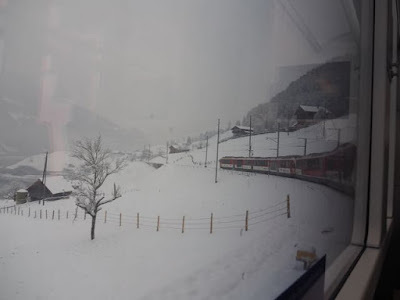 Besides delaying us over an hour, the only real problem with our delay enroute is that we were unable to partake of the special Golden Pass Panorama car that we had reserved. About halfway into this last train I realized that my iPhone was missing. I knew I had it when I boarded the train and guessed that it had fallen out of my pocket into the seat cushion but we could not find it. Then I remembered to pull out my iPad and do a “Find my iPhone” which allowed me to start the phone alarming – and we shortly found it. Thanks Apple! Our hotel, the Hotel Suisse Majestic was literally across the street from the Gare. We all ended up in nice rooms, some of which faced the lake. We got somewhat lost on the way to dinner, but eventually found our way to a restaurant which was less expensive than we’ve been used to (but still expensive by US standards) and had great food. This day was the highlight of the trip – err wait I can’t say that because there have been one or more candidates for highlight of the trip every day of the trip. We started with a train from Montreux to Brig. We were supposed to be on an IC (intercity) train, but atypically ours was running 10 minutes late so we hoped on a regional train instead. It was a bit slower, but we still got to Brig in plenty of time for our connection to Zermatt. Before boarding our narrow gauge Matterhorn Gotthard Bahn train to Zermatt we checked our luggage in lockers at the Brig station (anyone remember when you could routinely do that at a station in the US?) We then boarded a comfortable train which left right on time at the Kalmbach hour. 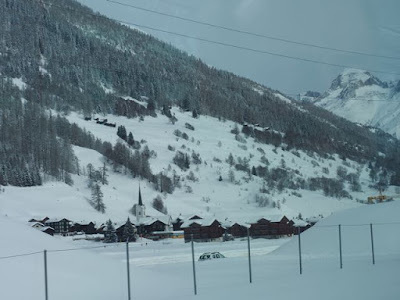 [ii] The run to Zermatt was full of twist and turns and incredible up and down grades. A combination of adhesion and rack are used to traverse the line. The scenery was incredible. I must have shot 100 pictures. 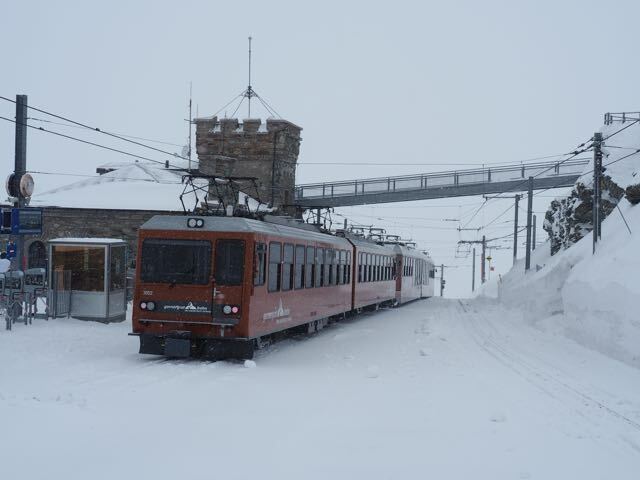 We arrived in Zermatt in time to catch the noon train to Gonergrat on the Matterhorn Gonergrat rack railway. This line was also amazing, with even steeper grades. Unfortunately, snow obscured much of the scenery but it also made the trip magical. The line exists mainly to server skiers and it was full of such people and all of their paraphernalia. The seats were wooden benches (essentially), but it was an incredible ride. Up at the top it was either 10 degrees F, or colder depending on which weather app you looked at. It was plenty cold for us. We took an elevator up to the hotel on site and had a nice lunch in their casual restaurant. Then, after taking a few more pictures, we reversed course down to Zermatt, and back to Brig. 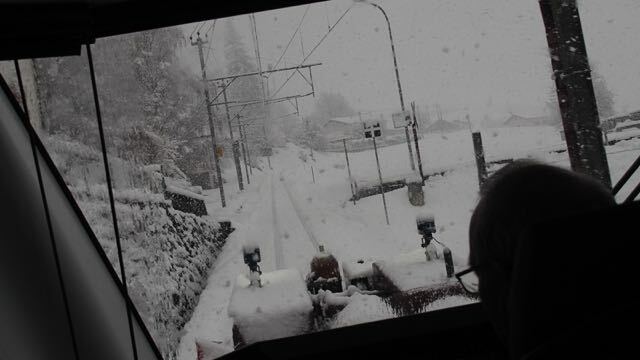 We got to ride in the front seat of the train down to Zermatt, and the engineer was kind enough to raise his curtain so we had a clear view out the front. The lines were somehow just as scenic returning as they had been going. 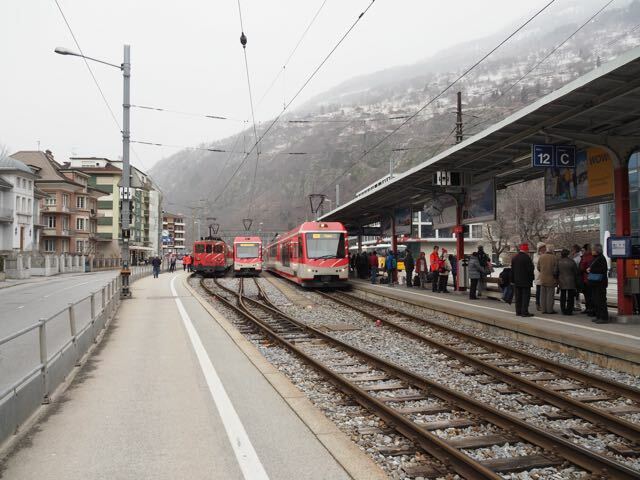 When we got to Zermatt we could either wait for a train that went clear through to Brig, or take one about 30 minutes earlier that only took us to Visp (just down the tracks from Brig). We did the latter and connected at Visp almost to the second (as in I barely made it aboard on time…being the slow poke of the group…before the doors shut.) Our hotel was only a few blocks from the station and had a good restaurant in it so that’s how we ended the day. The weatherman lied…we had sun most of the day. The train to Arosa and return – which we just threw in because we could – turned out to be at least as awesome as the Glacier Express…a great surprise. Our train out of Brig did not leave until 10:18am which meant that we could sleep in a bit (relative to other days). I woke about 7 on my own schedule, took my time getting ready, went down for breakfast where I met the others, and still had a goodly amount of time before we had to leave for the station at 9:30 or so. Our train, the Glacier Express, pulled in from Zermatt at about 10:11 and we, along with a mostly-Japanese tour group, boarded car 21 and took our seats. The four of us were seated at a table for four at the rear of the train. Across the aisle from us was a friendly Australian fan who was traveling by himself. Almost immediately after leaving Brig the train, operated by the Matterhorn Gotthard Bahn as far as Disentis began to climb – and climb a lot. We went from an altitude of 2,270 feet to an altitude of 6,706 feet (at Oberalps) in 48.3 miles (as the train travels). This is accomplished by both adhesion and rack running. There was snow everywhere and lots of incredible scenery. Our table was set for the three course lunch we had purchased in advance. As we boarded our waitress took drink orders. Just before noon they served us Cream of Asparagus soup, Hungarian Goulash with rice and carrots, and tiramisu all of which was delicious. At Disentis the train is taken over by the Rhätische Bahn for the rest of the journey into Chur, where we were stopping for the night (actually two nights). Though mostly downhill, the line is nearly as scenic as the line going up hill. Amazingly, although they changed crews and power at Disentis, all of this was accomplished in mere minutes. Our new engine was striking in that it was wrapped with a salute to a Japanese partner of the RhB, the Hakone Tozan Railway. 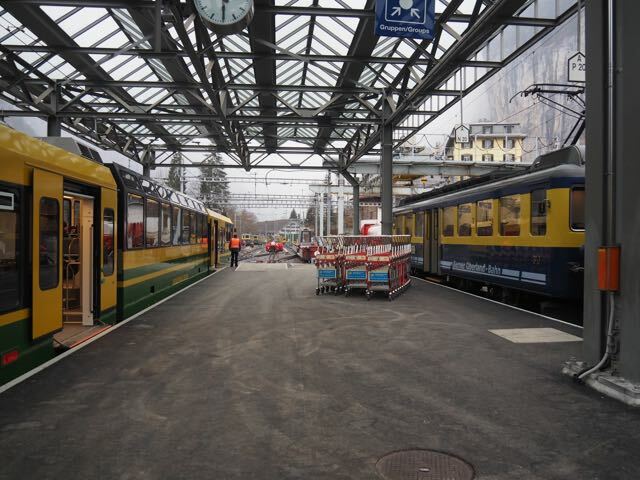 We arrived in Chur on time and in plenty of time to store our bags in a station locker and catch what we thought would be a “throw away” trip to Arosa. Instead we found a line that was incredibly scenic…easily the equal of the Glacier Express without all the trimmings. We had a first class car to ourselves (more or less) in both directions…on the way back in the cab car so we could watch out front over the engineer’s head. We had street running in Chur. We had fast climbs and equally fast descents all using adhesion. There was an incredible bridge used only by the railroad that spans a wide valley. It was a terrific ride that took about 3 hours with a 30+ minute layover in Arosa. Highly recommended. We arrived back at Chur a bit late, at least partially due to street traffic as we approached Chur where the train shares the streets with the automobiles. It was a fairly easy walk of less than 10 minutes to our hotel where we spent the next two nights. We traveled between those two stations in the morning between roughly 10:30am and noon, and again in the afternoon between roughly 1:30pm and 3pm. 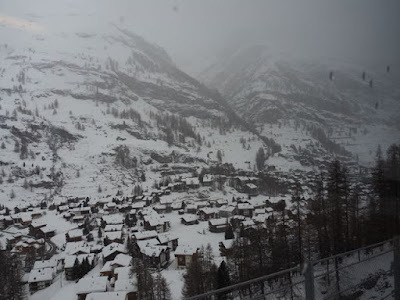 In other words, we nearly got stranded somewhere (probably Tirano, Italy) or actually caught in an avalanche. 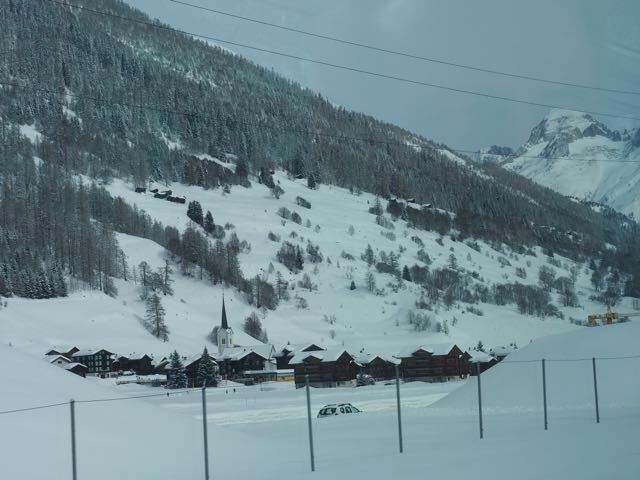 We awoke to the threat of significant snow and shortly after leaving Chur to the reality of that snow…and I mean a lot of snow. 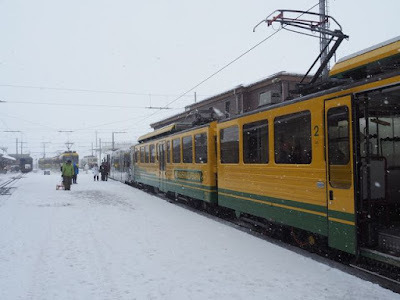 It was snowing so hard that our luxury sightseeing train was a joke…all we could see what white stuff everywhere…I’m talking about whiteout conditions sometimes. 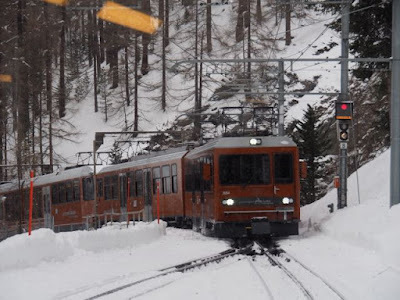 In spite of this, and in a situation that would have US railroads closing down lines much earlier than the Swiss did, the train ran only marginally late down to Tirano. Late enough that we were sweating our connection back north, but not so late that it was impossible to imagine making it. Finally, the conductor told us that there would be no problem – but this was after we waited for 20 minutes for a massive snow plow to come through after clearing the line ahead of us. 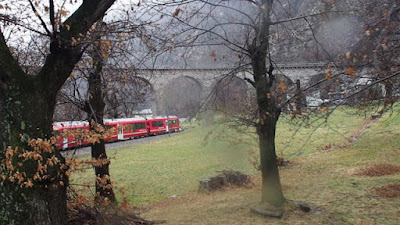 As we approached Tirano we were able to see better – it was merely drizzling there – and in particular saw and filmed the train going across and through the famous Brusio spiral viaduct. We made it to Tirano, as promised, with time to spare. Neil Lang left us here to catch a train to Milan and eventually Venice to resume his real vacation. Phil and I headed north over tracks that we could not see. On this ride we had a private car to ourselves…not really, but we sat in the front of the cab car with a clear view of the snow ahead (but not the tracks.) At Poschiavo they attached a snow plowing machine to the head of our train. The conductor explained that it’s purpose was to clear the area between the rails. It certainly did that, and provided a dazzling show of winter railroading with snow blowing everywhere. I grew increasingly nervous that we would not make it through to our destination, St. Moritz (where Rick would join us), and as you can see from the item above my concerns were not totally unfounded, but we made it in plenty of time to catch our next train which went from St. Moritz to Landquart. This line was in somewhat better condition than the line over which we’d just traveled. In fact, as we approached one town (I forget which) there was actually a steam train excursion waiting for us to pass so that it could head the other way. We had no clue to expect it. As we got nearer to the 12-mile long Vereina Tunnel we saw a massive, single lane traffic jam stretching for kilometer after kilometer on the road that paralleled us. We entered the tunnel and were passed in the other direction by several auto ferries which I imagine eventually disgorged their contents and added to the jam at the other end. 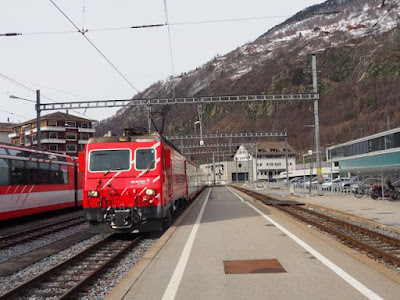 We were running late and I checked our connection from Landquart back to Chur and discovered that only limited service was being offered due to problems with the overhead wires. By the time we got to Landquart, about 45 minutes late, apparently the problem had been resolved and we quickly got on another train to take us back to Chur. 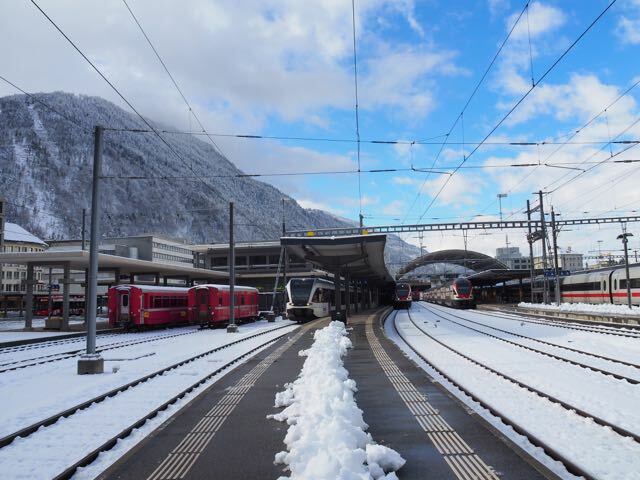 In spite of the horrendous operating conditions and unbelievable amounts of snow, the Swiss railway system managed to get us back to Chur in one piece less than one hour late. 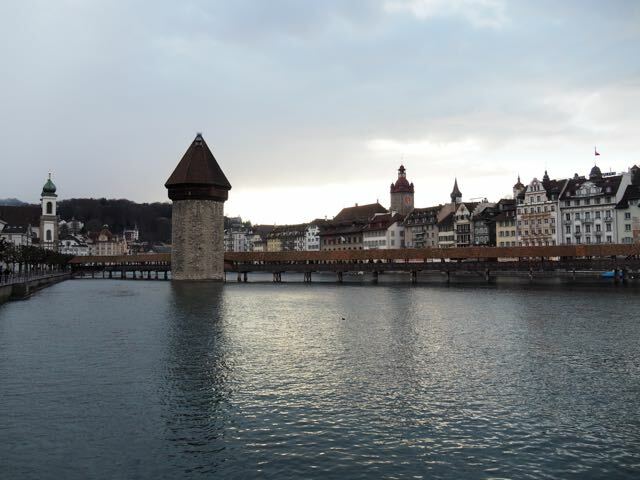 As we neared the end of our tour, we went from Chur to Lucerne. 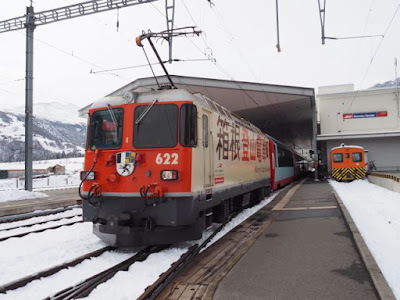 We had intended to start the day by retracing our steps from Chur to Filisur on the Bernina Express line and then from there to Landquart (about 12km from Chur) via Davos Platz – all narrow gauge mileage. However, the previous evening we were all so exhausted that Rick proposed that we eliminate that leg of the trip and get both a later start out of Chur, and and earlier arrival in Lucerne. So instead of leaving from Chur at 7:58am and arriving at Lucerne at 5:20pm we left Chur at 10:12am and arrived at Lucerne at 4:20pm. 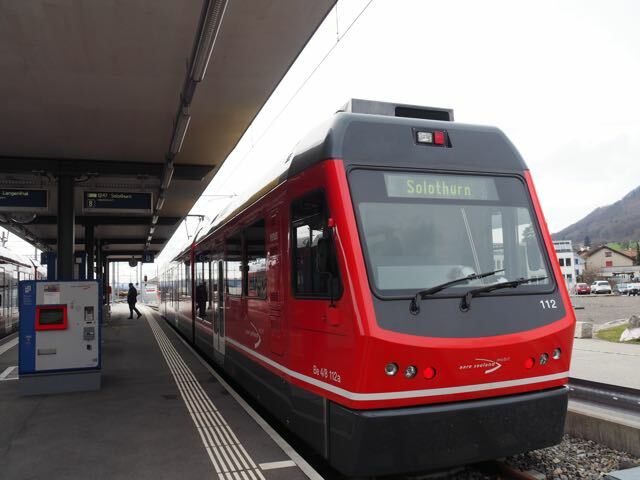 The trip to St. Gallen from Chur was via a single train that took under 2 hours. To me it wasn’t very remarkable, but that’s probably because I’e become jaded (we’d left Munich exactly one week prior.) When we got to St. Gallen we had to hunt for the station for the Appenzell Bahn and our train to Appenzell and ultimately Wasserauen. This is another independent narrow gauge line and we rode in a “private” first class compartment for much of it. The train uses a combination of rack and adhesion. As it left St. Gallen it immediately climbed at an incredible slope. According to George Drury’s book the grade out of town is at 9.2% which I find unbelievable except that now I’ve done it. Really great scenery to Appenzell and ok scenery to Wasserauen. We were in the latter for only a few minutes before the train took us back through Appenzell and onto Herisau (not too far from St. Gallen, and site of a famous and beautiful stone arch bridge) where we were picked up by a Voralpen Express train for Lucerne. We settled into a mostly empty first class car and found the scenery to be ho hum (jaded much?) until we got to Pfäffikonwhere there was an incredible number of trains headed every which way—up to Zurich, down through the Gotthard pass, etc. From there all the way to Lucerne the scenery was incredible with massive grade shifts, lakes, and believe it or not (after the day before) sun. We arrived at Lucerne right on time and it was a very quick walk to our hotel, the Hotel Astoria, which may have been the nicest room of the trip and was certainly the best value Later that evening we had dinner at an English Pub before calling it a night. Lucerne was a fantastic city that I want to visit again. At the station I picked up some water and soon we boarded our first train of the day. 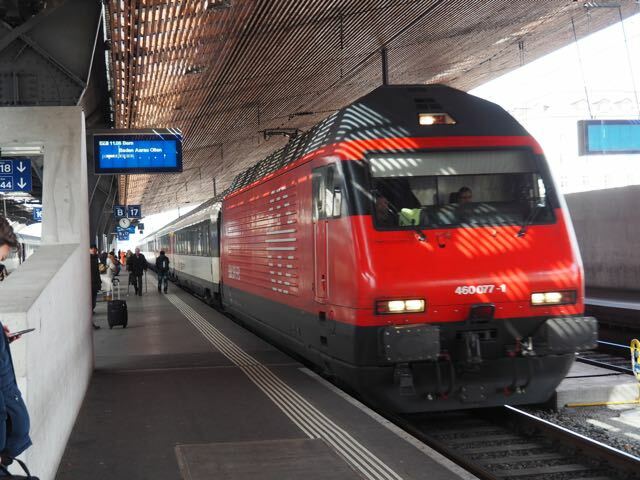 It was the 9:35am to Zurich. It was a double decker regional train that left on time and arrived on time and was quite comfortable (though I personally prefer the single level cars as the windows are usually great on those.) As has been the experience for most of our trip, first class was nearly empty. When I planned the routing for our trip I had a fairly short connection at Zurich – one that we probably couldn’t make. Rick pointed this out way back when and so we had a 40-minute layover until our next train. We used that time to pick up some sandwiches for lunch later (though we really didn’t have to.) Our next train went to Olten via Baden which was a quick trip that let us see a lot of the (lot of) activity around Zurich and elsewhere. It was really a train every minute for a while. 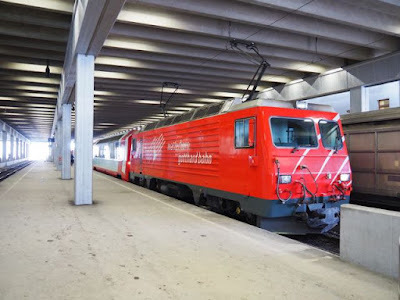 At Olten we got on to another double decker but rode in the lower level since we were only going to be on board for about 12 minutes to Langenthal. 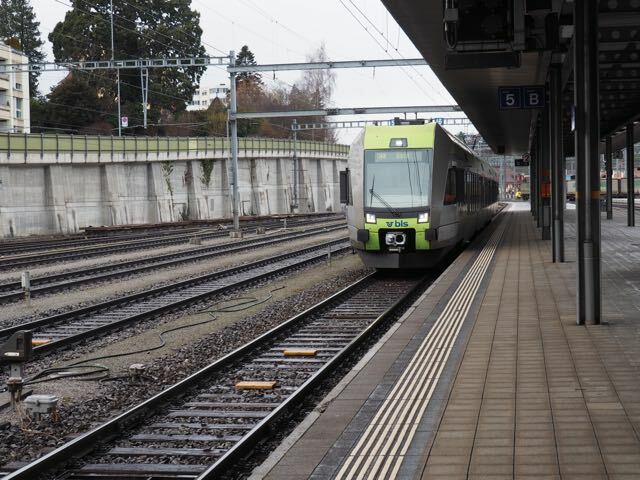 There were more direct and faster routings from Zurich to Langenthal, but we chose this one because less time was spent in tunnels. 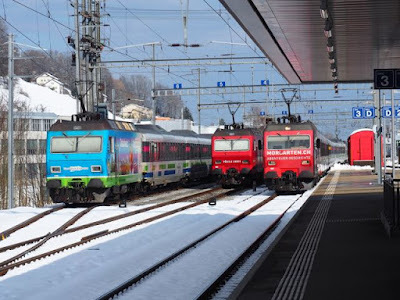 At Langenthal we transferred to what is basically a modern looking old fashioned meter gauge interurban line operated by the Regionalverkehr Oberaargau (RVO). 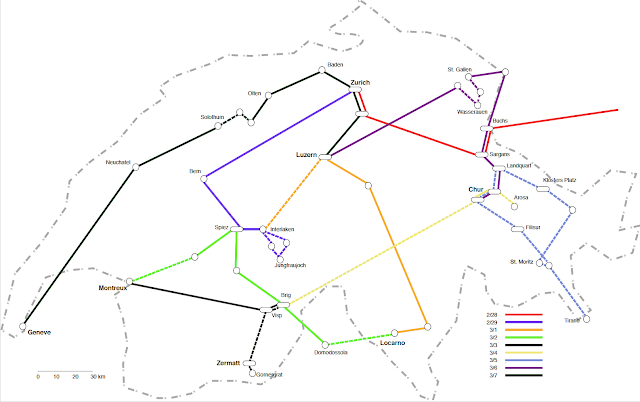 Its topological profile is similar to many for the interurbans of yesteryear – a lot of up and down and left and right over non-mountainous country. It was a fun ride that took us from Langenthal to Niederbipp to Oensingen back to Niederbipp and on to Solothurn. 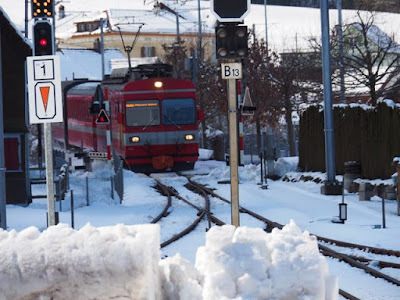 We could have taken a mainline train from Niederbipp to Solothurn but this was a lot more fun. At Solothurn we had a lengthy layover until our high-speed intercity train to Geneva arrived (on time). While we waited Phil went across the street to grab a Mickey D’s fish special. Rick and I waited in the not very comfortable two seat area in the ticket office. The train to Geneva was our only tilting train on the trip. 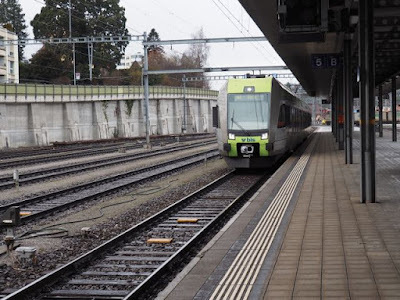 I had worried that I would become nauseated as I had many years ago on a Swedish train that used tilt technology, but instead the tilting rocked me to sleep for the last 20km or so (Rick says more) of the trip. 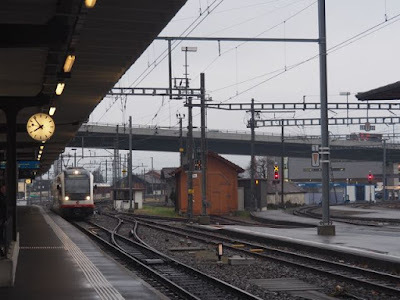 We rode the train beyond Geneva to its terminus at the Geneva Airport and then another train back to Geneva (about 7 minutes each way). 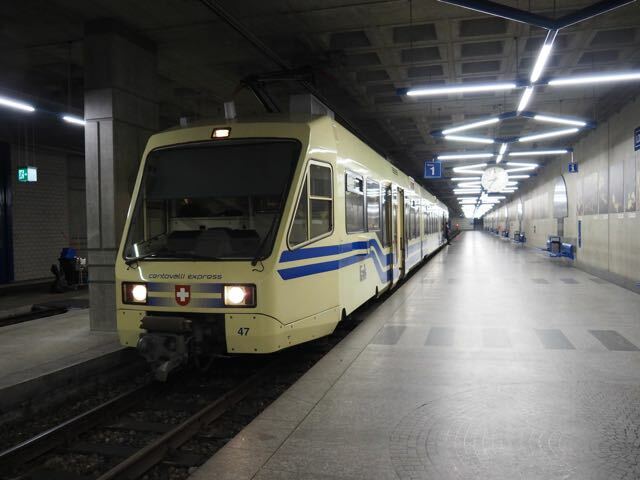 For my return to Pittsburgh, I slept fitfully and awoke in Geneva before 6:00am ahead my alarm which I had set for 6:15 figuring that I would catch either the 7:02 or 7:20 train to the airport (covered by a transit pass that the hotel gave me when I checked in.) As a result, I found myself on the 6:47 to the airport. Since Switzerland is in the Schengen Area there was no passport control prior to my flight to Paris, and I was in the Air France Lounge before 7:15 for my 9:10 flight. I should explain my routing. The quick routing would have been GVA to EWR and then onto PIT on United. I elected not to do that because: 1) I had some Delta points that I needed to use, and 2) I wanted to experience a non-US carrier (when I travel for business I am required to use a US carrier.) There are no one stop routings on DL to PIT and all of two stop choices were more or less equivalent in terms of elapsed time, so I chose one that would let me experience flying in an aircraft that I had not flown on before—the A380. The result was a fairly lengthy layover in both CDG and JFK but luckily I was able to use the Air France and Delta lounges there as well. While I am thinking about it, I’d like to report that the Delta lounge at JFK was miles above the Air France lounges at either GVA or CDG…a fact that surprised me. Anyway, the flight to CDG was in an A318 I believe and was fairly comfortable. They served a cold breakfast in business class for the one-hour flight. 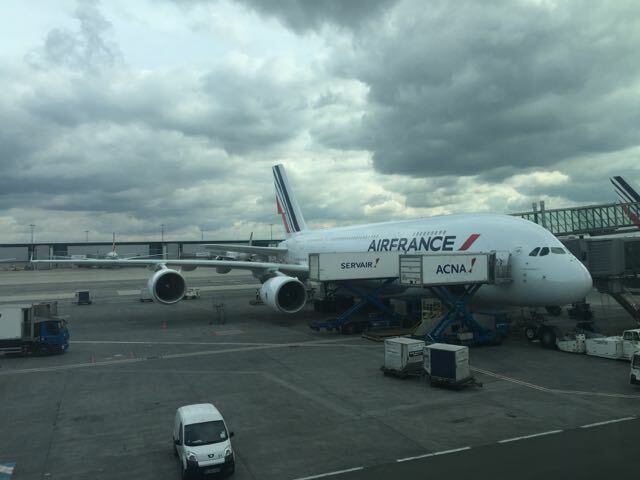 We arrived at CDG on time – but my connection wasn’t tight as already mentioned, so I took my time getting from Terminal 2F to Terminal 2E. I did not see any signs for transportation between the terminal and it was about a 30-minute walk, but I needed the exercise. At 2E I checked in at the lounge and then went in search of some Foie Gras to bring home with me. Then I settled into the lounge for the longish wait (my flight was at 1:55pm.) At the appropriate time I walked over to the two gates assigned to the A380 and marveled at the huge aircraft that awaited. We loaded a bit later than planned but left right on schedule. 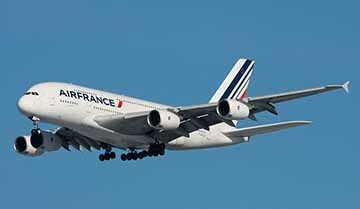 My seat was in business class which on the AF A380 is at the front of the second story of this two story airplane. Unlike the last time I flew on the second story of an airplane (a UA 747) one does not need to climb stairs on the aircraft to reach the second story seats…there are boarding ramps for both levels. As expected the main meal on this flight was great. It included a salad with a goat cheese/foie gras combination, a wonderfully prepared cod on saffron infused rice, some cheeses, and some very nice desserts. I elected to not take the light snack that was offered just before landing, but it looked very good. By the way, it was International Women’s Day and in honor of that the entire crew from pilots to cabin attendants were women. I understand that several other airlines did that as well. We landed early, but by the time we actually got to the gate and they got the jet way set up, we were essentially right on time. (The official AF site says we left one minute late, and arrived 2 minutes early.) At immigration I took advantage of my Global Entry but for some reason my fingerprints would not scan properly so I had to go through one of the kiosks. A CBP person took me to the front of the line so it was not a big deal. Then the luggage (I had checked my bag for the GVA to JFK segment of the trip) took forever to arrive. As a business class traveler they had put a “priority” label on my bag – along with apparently half the others on the flight. I’d say I waited a good 30 minutes for my bag to finally show up. Customs was quick – I just explained that the “food” I was bringing in was chocolate and foie gras – and I soon caught an AirTrain to terminal 4. After talking with Barb and Lizzy (who had waited up) and playing with the dogs I went to bed and slept soundly for nearly 8 hours before I woke. It was a great week+ of riding some fantastic trains with some good friends in a fascinating country. I had a ball and while I won't do it exactly this way when I return, I definitely hope to return to Switzerland. [i] A milepost is number visible from the train that indicates the distance from some other point on the railroad. For example, if you are riding on the ATSF line from Chicago to Aurora and you spot the milepost “27” you are 27 miles along that line from Chicago.